A Medal of Honor is the highest award that the military can bestow a soldier that has shown courage beyond the call of duty. But how far must a soldier go to get such an award? A said candidate knows, Staff Sergeant Antonino Basa of the 14th Scout Ranger Company. A dedicated soldier who’s been wounded five times in battle who received five Gold Cross medals due to his endeavors. Basa is truly a courageous man whose heroism goes beyond the call of duty. Netizen Josephine Jaron Codilla narrates in her Facebook post that Basa has received these Gold Crosses due to his courage, he was wounded once in Basilan, three times in Marawi and recently, this March, in Sulu. 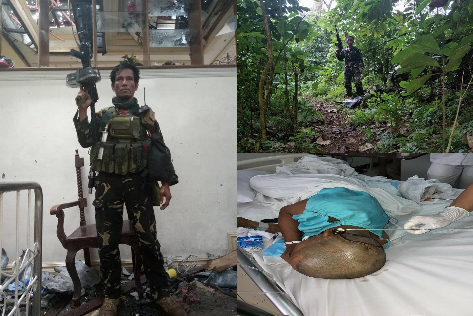 He has been diving into the dens of the Abu-Sayyaf and been jumping into improvised explosive devices (IED) to protect his comrades. Basa’s also been recommended for the Distinguished Conduct Star and the Medal of Honor due to almost dying from their encounter with the Abu-Sayyaf Group in Sulu this March 13 only. He almost died after being shot to the head by an M14 bullet, luckily it didn’t reach his brain. “I am emotional and so touched by his gesture to salute me even if he is still incapable of moving his hand and body,” he stated after visiting Seargeant Basa last March 15. For despite being subconscious, Basa still displayed the “highest sense of honor and respect to his superiors. “It only shows that even in his subconscious he still practiced the highest sense of honor, obedience and respect to his superiors and to the flag. I have given orders for my staff to work for the revival of his Medal for Valor award recommendation and for the other awards that are due to this battle-tested brave soldier," he added. “Ang hangad ko po bilang isang sundalo ay sundin ang nakakataas sa akin at paglingkuran ang bayan,” Basa replied. “Makailang beses na niyang ipinakita ang ‘acts of conspicuous courage, gallantry and intepridity above and beyond the call of duty’,” Codilla stated. Codilla ended her post by hopefully wishing that Basa doesn’t get his 6th Gold Cross and rather get the Medal of Honor that he, without doubt, deserves. And that Basa finally gets to meet his wife that’s recently been through labor.